I used pork instead of beef, but will try beef in the future. I marinated the pork in soy sauce, sugar, salt, pepper, oyster sauce, chinese sherry, garlic salt and sesame oil for 12hours. I omitted peppers and spinach. Used oyster mushrooms instead of white mushrooms, but I think white mushrooms would be better. Heat oil in a wok over high heat. Carefully dry ribs with paper towels, then add to oil and fry until golden brown, about 5 minutes, turning and agitating occasionally as they cook. 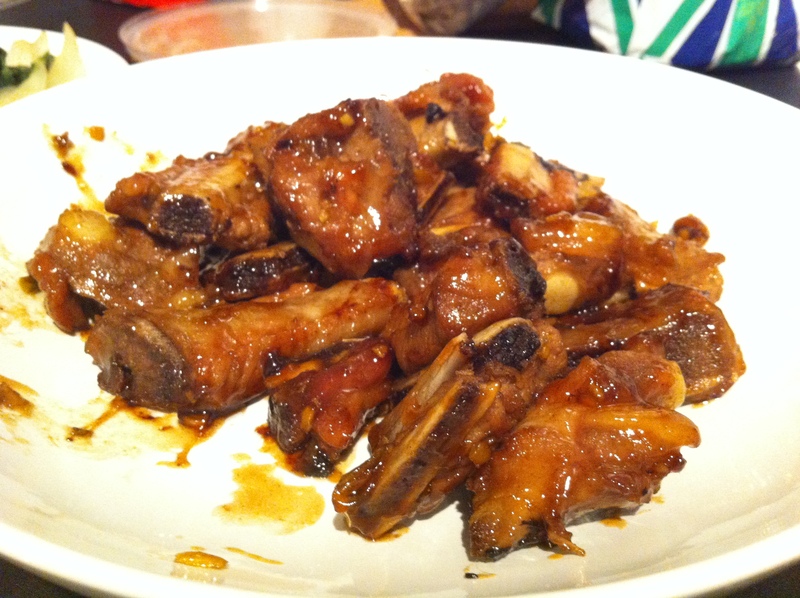 Using a slotted spoon or chopsticks, transfer ribs to a paper towel-lined plate. Set aside. Pour all but 3 tablespoons of the oil in the wok. Return wok to medium heat and heat oil until shimmering. Add the scallions and ginger and stir-fry until fragrant, about 30 seconds. Add the ribs and stir-fry for a minute longer. Carefuly add enough water to cover the ribs at least ¾ of the way, about 1 cup. Add the soy sauce, sugar, and salt. Simmer over low heat until the ribs are tender, 30 to 40 minutes. As the liquid reduces, turn the ribs and spoon the liquid over them. When the sauce has reduced to syrupy consistency, add the vinegar and cook for a few minutes longer. Turn off the heat, drizzle in the sesame oil if using, and serve warm or at room temperature. Note: Get pork ribs with more meat. It is important to simmer for a long time for the meat to be tender.